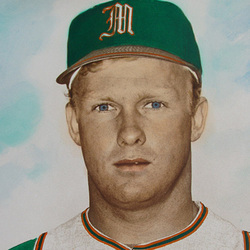 The very first Hurricane baseball player to be named a first team All-American, Larry Pyle is the fifth baseball representative to enter the UM Hall of Fame. A three year star in the outfield at Miami (1967-69), the Mount Tabor, New Jersey native was named to Sporting News All-American squad in 1968. During that all-star season, Pyle led the UM in hits (42), doubles (10), triples (20), home runs (6), RBI (26) and average (.316). His 74 total bases set a school record, but he quickly topped that mark with 91 bases in 1969, while also setting a season record for runs scored with 38. Although Pyle did not play in the true glory years of the 1970's and 80's, he had the strength and power to establish hitting standards that still stand today. He is the single season batting average record holder at Miami (.431 in 1969). He also holds the career slugging percentage mark (.623). Pyle ranks second on the UM all-time list for slugging percentage in a season (.700) and third in career batting average (.359). Following his junior year, Pyle signed with the New York Yankee organization, where he advanced to the AAA level of the farm system.